The brain is complicated. After a century of research we are still making new discoveries every day. Our knowledge of how this organ works is limited because it is a network of highly-specialized cells and the network is always being rewired. This is one of the reasons why building an understanding of what can go wrong in the brain is such a difficult process—a process that is only made more difficult by the solid protection of the human skull which makes the brain a challenging and expensive organ to assess. When it comes to finding treatments for brain disorders, it can be a lot like trying to hit a bullseye on a dartboard. But, the reality of this analogy is that for many brain disorders, we don’t even know what the dartboard looks like. In these situations, doctors rely on the evidence they have and are stuck with the trial and error process to determine the best available treatment. One strategy to overcome this challenge is to identify disorders earlier, provide more accurate diagnoses, and develop better treatments by identifying biological markers in our blood, brain, and body that can provide indicators of change. Biological markers, often shortened to biomarkers, are molecules in our body such as the DNA that contains our body’s genetic blueprints, or the proteins that allow our cells to work properly. They contain a wealth of information that can indicate the body’s status at any given time and can serve as ways to measure health or disease. 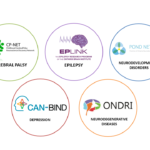 Identifying biomarkers of brain disorders is a key initiative being undertaken by OBI’s five research programs that focus on: epilepsy (EpLink), cerebral palsy (CP-NET), depression (CAN-BIND), neurodevelopmental disorders (POND) and neurodegenerative disorders (ONDRI). Each program takes a unique approach to incorporating biomarkers in their research with the goal of finding new ways to predict, diagnose, and treat brain disorders. Children with neurodevelopmental disorders will often display symptoms of various conditions as their brains develop. This can make it difficult to provide a clear diagnosis. However, we know that early intervention is one of the best ways to help these children to thrive. So, how can we improve methods for diagnosis so that doctors can intervene earlier? 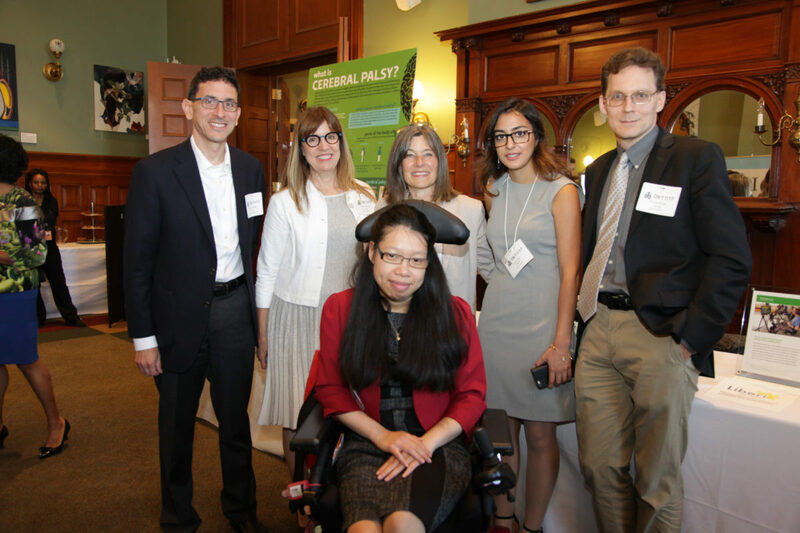 Genetic biomarkers found within a patient’s DNA such as mutations, or even larger chromosomal changes are a central focus of the Province of Ontario Neurodevelopmental Disorders (POND) Network. By focusing on genetic biomarkers observed across all disorders studied in POND: autism, obsessive compulsive disorder, attention deficit hyperactivity disorder, Fragile X, Down’s syndrome, intellectual disability, Tourette syndrome, and Rett syndrome, researchers are hoping to identify a new way of providing a biological diagnosis of neurodevelopmental disorders using genetics. OBI researchers are searching for new biomarkers to breakdown current definitions of neurodevelopmental disorders and provide a new method for identifying them. Researchers are combing the DNA of POND participants to identify genetic biomarkers observed across many neurodevelopmental disorders. So far, POND researchers have successfully identified DNA markers that are common in autism spectrum disorder that include several specific mutations—but, the ultimate goal goes further than just one disorder. The hope is that we can find biomarkers that are common to children with different types of neurodevelopmental disorders to find treatments that are better suited to individual children, regardless of their specific diagnoses. For other types of disorders, genetics have not always been an obvious place to look for clues. Cerebral palsy, or CP, is the most common physical disability in children. Historically, CP has been attributed to an injury in the developing brain that occurs during or shortly after birth. While genetic risk factors were also believed to be implicated, genetic testing is not routinely performed when assessing the cause of CP. A national effort supported by NeuroDevNet, that included investigators from CP-NET, OBI’s research program focused on CP, made a discovery that could lead CP research in another direction. CP is not commonly thought of as a genetic disorder and this discovery provides new clues about its cause and risk factors. There are many types of genetic changes which can occur, and all of us carry some within our own genomes and they have no major health effects. Some changes we inherit from our parents, and some arise spontaneously when DNA copies itself. When these changes occur in a critical part of the genome they can lead to genetic syndromes. A specific type of genetic change is called copy number variation which describes a major structural change to the genome where a large part of DNA is duplicated or removed. While a certain amount of diversity in individuals’ copy number variants is healthy, particular variations can be implicated in disorders. Researchers found that a significant number of children with CP that they looked at had genetic abnormalities related to copy number variants and those children were more likely to have some of the most severe motor impairments experienced by people with CP. This tells us that there may be a new opportunity to find genetic biomarkers that would help doctors and genetic counsellors discuss genetic risks and diagnose CP earlier. As is the case with most disorders, early intervention is essential. Depression is another example of a disorder that presents doctors with a complicated set of symptoms. It will often take several attempts to find the best treatment for someone seeking help because the course of depression is often unknown at diagnosis. That is why doctors are turning to brain imaging, mood assessments and blood biomarkers including immunological and inflammatory responses to give better definitions of the ‘types’ of depression that may exist. OBI’s research program focused on depression, the Canadian Biomarker Integration Network for Depression (CAN-BIND), wants to identify factors that can predict an individual’s treatment response to antidepressant medication. Throughout the depression pilot study called CAN-BIND-1, participants provide blood and urine samples, which are evaluated to identify DNA and proteins that predict treatment response. These biomarkers are being used to help researchers and clinicians better understand and subsequently predict the course of depression so that each individual can be matched to the most effective treatment. Neurodegenerative disorders like amyotrophic lateral sclerosis (ALS), Parkinson’s disease, Alzheimer’s disease, vascular cognitive impairment, and frontotemporal lobar degeneration are starting to be seen as having more in common with one another than was once thought. As is the case with most disorders, prognosis can be improved if treatment begins early after diagnosis. To make early diagnosis possible, researchers are not only using classic biomarkers such as genes, molecules in the blood, or brain imaging to identify biomarkers. OBI’s Ontario Neurodegenerative Disease Research Initiative (ONDRI) is designing new assessments to detect signs of dementia across various neurodegenerative disorders. One example uses the eye as a window into the brain. By examining a participant’s eye, researchers measure the changes in the thickness of the retina caused by the buildup of amyloid beta protein, the same protein that has been found to buildup in the brain of a person with dementia. Researchers at the University of Waterloo have decided to walk a different path to discover biomarkers by taking a closer look at the changes in balance and gait seen in Parkinson’s disease. Recently, they have discovered that subtle changes in gait can also be observed in patients with Alzheimer’s disease. To detect the changes researchers have developed ultra-sensitive gait assessment equipment that can detect early changes in walking style when someone is affected by neurodegeneration. Each of these approaches form part of a collaborative approach to better predict, diagnose, and treat brain disorders. Imagine a future where a small saliva sample or drop of blood allows doctors to rapidly and accurately diagnose a disorder and then quickly tailor a therapy to address the problem. Biomarker research is helping investigators focus on some of the clues that will help us demystify brain disorders—it is helping us build a dartboard where doctors have a better chance at throwing a bullseye.